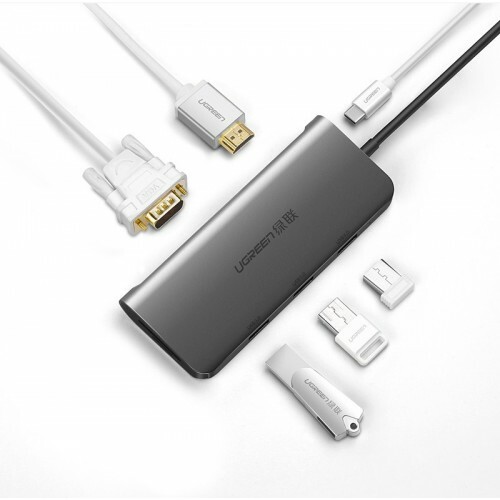 UGreen USB-C Multifuntional Adapter easily expands your USB C (Thunderbolt 3 compatible) enabled Mac with HDMI, VGA, 3xUSB 3.0 port, 3xUSB 3.0 portand 1 Type-C Power Delivery 3.0 charging port.HDMI or VGA output allow you to mirror or extend Macbook to HDMI-enabled TV in Max 4K UHD 3840×2160 at 30Hz or VGA display in up to 1080P at 60Hz Full HD.HDMI and VGA outputs can NOT be used simultaneously.Work perfectly for 12 inch new macbook, MacBook Pro 2017 2016, Google chromebook, Dell XPS 13 15, Lenovo Yoga 900, HP Spectre notebook, ASUS ZenBook3, Huawei Matebook, Samsung Galaxy S8 S8+ S9 etc. REMINDER: Compared to plastic case, aluminum case has better thermal dissipation which means heat occurred inside would be conducted to outside more quickly, making this adapter safer but hotter (which is normal) than plastic case and also Support PD charging at max 20V 3A.3-Port USB 3.0 hub let you continue to use existing USB 3.0 peripherals like flash drive, hard drive, keyboard, mouse, printer, thumb drive or USB sticks with your new Mac. Work perfectly for 12 inch new macbook, MacBook Pro 2017 2016, Google chromebook, Dell XPS 13 15, Lenovo Yoga 900, HP Spectre notebook, ASUS ZenBook3, Huawei Matebook, Samsung Galaxy S8 S8+ S9 etc. REMINDER: Compared to plastic case, aluminum case has better thermal dissipation which means heat occurred inside would be conducted to outside more quickly, making this adapter safer but hotter (which is normal) than plastic case.